The Justices are in, but will things really change? Six years after the idea of a UK Supreme Court was formed and 24 hours after its opening, the Court continues to be the source of lively debate. Many are concerned that this long-awaited change to the British constitution is in fact purely cosmetic and that promises of independence and transparency may not be met. Lord Phillips, head of the new panel of judges who sat at the House of Lords until the end of July, had hailed the new court as an opportunity to bring to the public the workings of the highest court in the land, but journalists and the public were told there was no room and the proceedings would be broadcast live from the chamber by its own team. The composition of the Justices also continues to be scrutinised – contemporary feminist site the f word has criticised the panel for not being more representative of the UK, saying “the only woman on the panel of twelve judges (although one seat is unfilled) is Brenda Hale (Baroness Hale of Richmond) who was also the first (and so far only [female] Law Lord) to be appointed. The f word also notes that there are no ethnic minority judges, but that if you drill down to look at who is doing the administrative work there is more diversity with the senior executive team having seven women (out of ten posts) one of whom (Head of Judicial Support) is from a minority ethnic group. Associated Press remarks that the Court was created to correct one of Britain’s ancient constitutional quirks. However, only time will tell whether it will make a real difference to the composition and transparency of the UK’s judicial system. 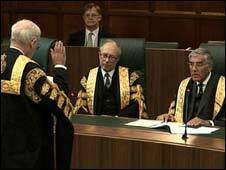 An article in the Telegraph also comments on the make-up of the Justices and judges in the UK more generally, saying “while the number of women and ethnic minorities in the legal field had been more than increasing steadily over several years, alarmingly, the country only managed to select its first female law lord in 2004. The North Wales Daily Post commented that the promised era of more open justice at the nation’s new Supreme Court was kicked off with the media being barred from the historic opening. It reported that journalists had to wait outside as the 11 new Justices of the Supreme Court were sworn in inside the refurbished Middlesex Guildhall in Parliament Square. Leave a reply on "The Justices are in, but will things really change?"